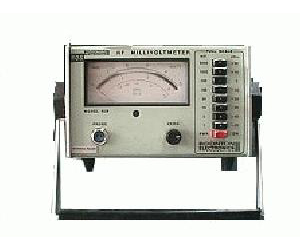 Quality, ease-of-use, and accuracy have all contributed to making the 92B RF Millivoltmeter a standard in the industry. Input ranges are 100 µV to 3 V and -60 to +23 dBm full scale. Measurements frequency range can be made from 10kHz to 1.2GHz with a basic accuracy of ±(1% of reading +1% full scale). True RMS ability for input levels up to 30 mV, approaching p-p above this level. Remote programmability.